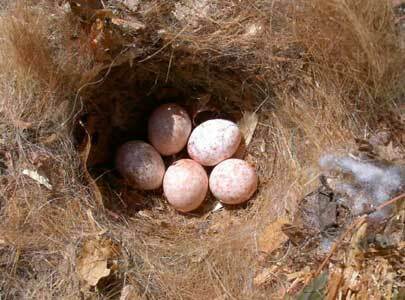 Tufted Titmouse eggs relative to a dime. Photo by Bet Zimmerman. 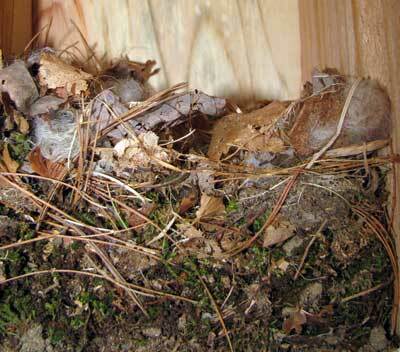 Photo below shows Titmouse eggs on left, House Wren on right. 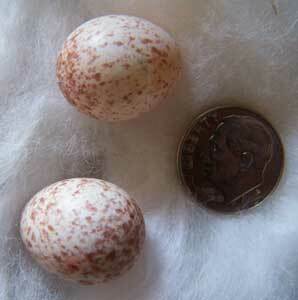 House Wren egg is smaller, glossier, more heavily marked, and pointier. This is in a plastic Bo Villa box mounted on a tree (with an anti-slip red rubber mat on the floor.) Unfortunately it was abandoned - possibly because the Titmouse was working on it and was startled when I opened the box. Tufted Titmouse nestcup. Photo by Bet Zimmerman. 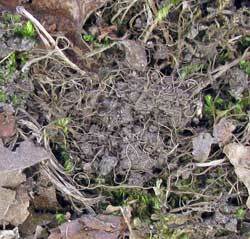 Description: Downy nest of moss, fur, and soft plant fibers. Occasionally primarily crumpled up dried leaves with grass, and a bit of snakeskin, cellophane, bark strips, etc. Cup may be padded with hair, fur, bits of string, or cloth. 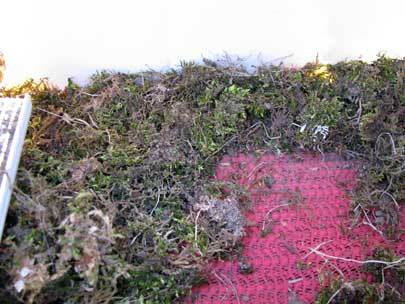 May have earwigs living under moss. 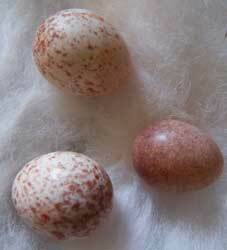 Eggs are white with rose/mauve speckles, little or no gloss, more evenly distributed than chickadee. 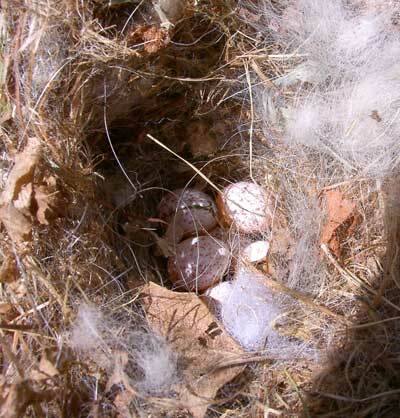 Tufted Titmouse nest (built over a bluebird nest). Photo by Keith Kridler of TX. Keith reported that bluebirds started a nest in this Springer Chalet with a 2" deep entrance hole that is 1&1/2" in diameter. They laid one egg several weeks earlier and then seemed to have moved about 700 feet away to a box well out in an open field. Tufted Titmice have laid three eggs in the box so far and you can see that the dark splotches on the bluebird egg show it to be getting rotten. Notice the piece of snake skin at the top of the nest cup and another piece just to the left eggs. This box is 9 feet off of the ground. 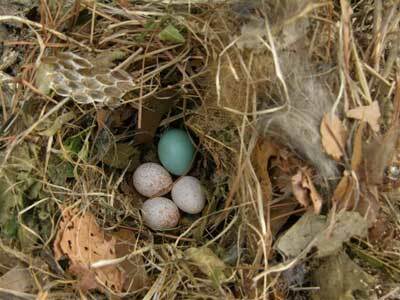 This nest belonged to the hissing drama queen (see video). Notice all the crumpled dry leaves. 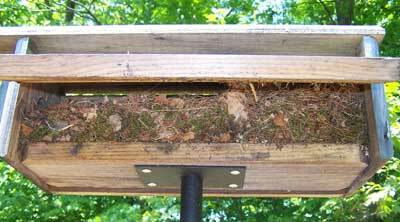 Tufted Titmouse nest in a large 2-holed hanging "mansion" nestbox. Photo by Bet Zimmerman. The nest lacks a padded cup. 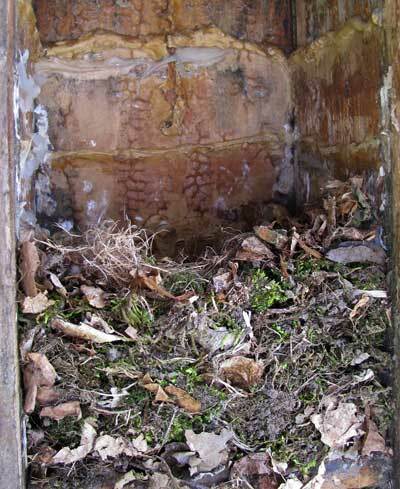 The nesting was not successful, as this is a no-trap experimental trail, and the box was taken over by House Sparrows. 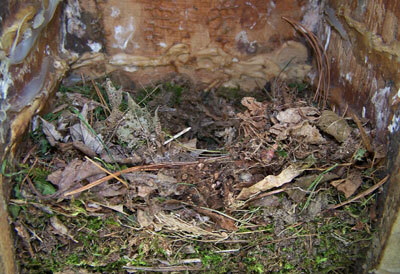 A Tufted Titmouse nest fills up almost all of this horizontal (Zuern tree branch) box. The actual nest cup is to the rear, right. VERY difficult to monitor except with a mirror When a mirror was used, the incubating female hissed at it (maybe saw its own reflection?) 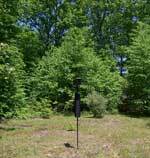 Habitat is near mature trees and a pond, but box is pole mounted out on a grassy area. 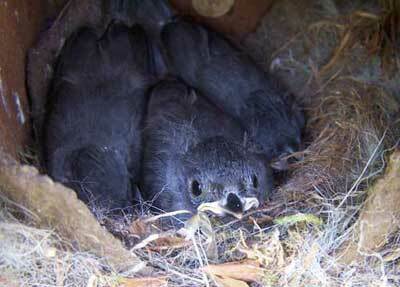 A TUTI nest in a large, two-holed hanging box by Linda Violett. Notice clumps of dirt, and crumpled, dried leaves. Nest cup is not complete (lacks fur lining). 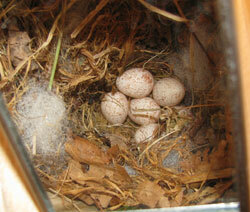 This nest fills up about 1/3 of the box. Notice pine needles. Photo by Bet Zimmerman. 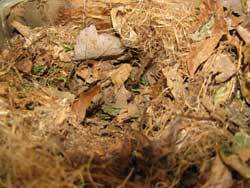 Below, photo of nest cup. 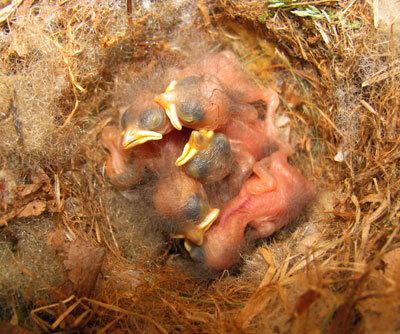 TUTI nestlings, very recently hatched. Mother was brooding. Photo by Bet Zimmerman. 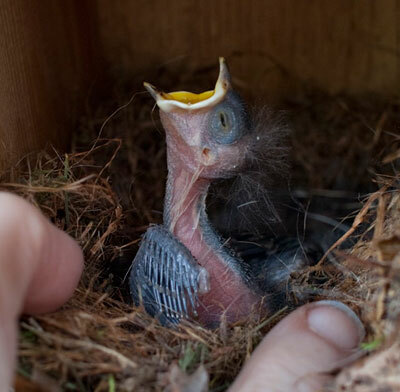 See another newborn nestling photo. Titmouse nestling, 9 days old. Photo by Nancy Brown. Notice eyes just starting to open. Taken with a Canon 5D Mark II, Canon L series lens. 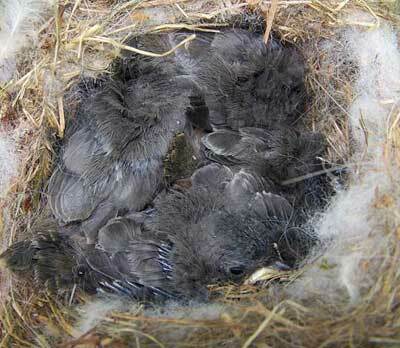 Tufted Titmice - 13 days old. Photo by Bet Zimmerman. 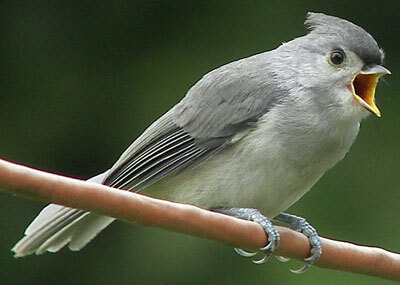 Tufted Titmice - age unknown. Nestlings fledged the next day, possibly due to nest disturbance. Photo by Bet Zimmerman. Juvenile Tufted Titmouse. Photo by Renee Harper of the Bluebirding Forum.